Bow Thruster for easy Docking! Well Powered w Cummins Diesels, Less than 1000 Hours! Wing doors and hardtop, Enclosed Aft Deck Open Bright & Airy Salon with Entertainment Systems; Separated Fore & Aft Staterooms w Private Facilities; Galley Open to Salon; Upgraded Electronics; Generator & Air Conditioning! 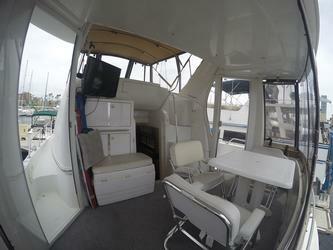 DECK & COCKPIT:Full Bridge Enclosure w Bimini; Windlass w Foot Pedals & Remote Spotlight; Aft Deck w Swim Ladder, Storage Box, Dinghy Davits; Formed in Stairs to Aft Deck; Forward Windshield Windscreen Covering; Aft Deck w New Makrolon Glass,Carpeting Deck Chairs & Table; Clear Plexiglass Wing Doors to Foredeck; Cabinet Storage & Flat Screen TV; Bridge Deck w Large Circular Seating; Wet Bar w Storage & Ice Maker; View; 10' Achilles Dinghy; Magnum Bar-B-Que; Paddle Board - Kayak Rail Holder; Wire Fender Baskets. HELM & ELECTRONICS:Captain's & Separate Companion Seat; Footrest for Captain's Comfort; Raymarine Tri Data, New Raytheon Touch Screen GPS - ChartPlotter; VHF Standard Horizon, Autopilot Simrad AP20, Radar; Accusync Engine Synchronizer; Morse Single Lever Engine Controls; Tilt Carver Leather Wheel; Compass; Stereo w - speakers flybridge;Bow Thruster "JoyStick". SALON: Rich Wood Grain Interior Finish; Lots of windows w Curtains & Blinds for Light & Airyness; L-Shaped Sofa with recliners to starboard; Loveseat with storage below to port; Moveable Cocktable w Storage, Raises to Dinette Table Level; Leatherette Upholstery; Overhead quartz lighting; Entertainment center w Flat Screen TV & DVD Player; Storage cabinets; Corian Countertops. GALLEY:Open to Salon w Overhead Natural Light; Wood Flooring & Cabinets; Corian Countertop; Lower Cabinets & Drawers; Stainless Steel Sink; Coffee Maker, Microwave; 3 Burner Glass Top Stove; Large Refrigerator w Separate Lower Freezer.STATEROOMS:Forward Private Stateroom w Privacy Door; Queen Sized Island Bed w Side Steps; Upper Gunwale Cabinet Storage; Separate Air Conditioning - Heating; Multiple Portlights & Hatch;TV System; Mood Lighting; Port Side Separate Shower w Seating, Fan & Portlight; Starboard Head w Upper Mirrored Storage; Corian Countertop Vanity; Private Aft Master Cabin; Queen Sized Island Bed w Nightstands; Dual Hanging Closets, Built in Drawers, Gunwale Cabinets; Aft Bulkhead Opening Window, Headboard Opening Portlights; TV - Entertainment System. Separate Air Conditioning & Heat Full Bathroom with Corian Countertop, Mirrored Cabinets; Separate enclosed Shower Stall. ELECTRICAL & MECHANICAL:Cummins 6BTA 370 Hp Diesels with Less than 1000 hours; Kohler 9KW generator in sound box, 700 Hours; 3 Marine Air reverse cycle air conditioner units; Windlass with foot controls; Remote Spotlight; Fire Boy Fire System. Visit www.SouthMountainYachts.com and watch the video tour! Call us NOW at (949) 842-2344. Represented by South Mountain Yachts a licensed & Bonded Firm. Located in Long Beach California.